The foodservice industry is growing fast, which makes becoming a chef a lucrative and appealing career path for many people. Additionally, the growth of the Food Network and proliferation of YouTube celebrity chefs have glamorized the industry. But, working in the restaurant industry is not like what you see on TV. 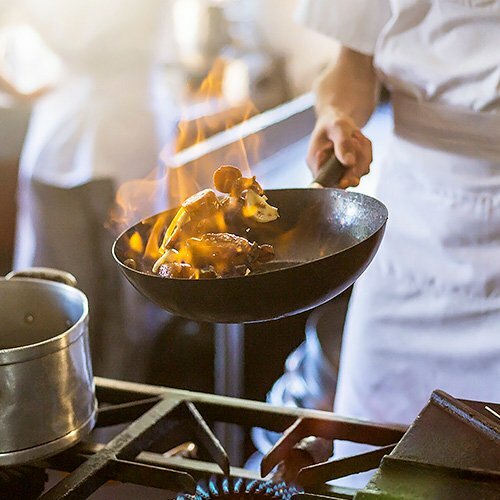 I spoke to our two in-house chefs, Greg Lieberman and Larry Williams, to get a better idea of what working in a kitchen is really like, and together we compiled this list of 9 things you should consider before becoming a chef. Working in a kitchen, you’re going to be standing and moving around for at least 8 hours. You’ll also need to be lifting heavy pots of food, carrying large bags of food, and stocking walk-ins with food, which can put a strain on your body. 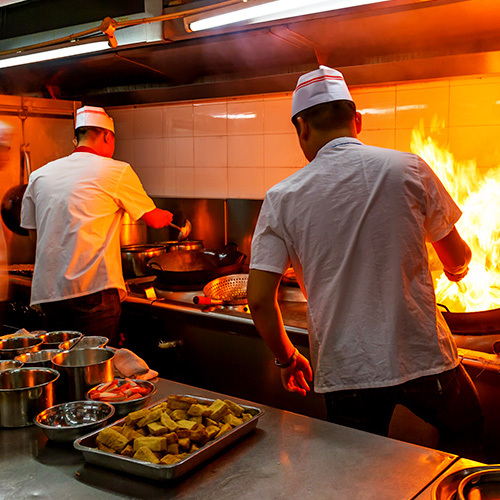 Greg says that working in kitchens is hot, crowded, and dangerous, especially during breakfast, lunch, and dinner rushes, when cooks will be scurrying around the kitchen to fill orders. For restaurants, weekends are the busiest time of the week, and, as a result, you’ll almost certainly be working weekends, which makes it difficult to make plans with family and friends. Additionally, the long hours will interfere with your other hobbies and passions. According to Larry, “You’re going to be working when people have off, and you’ll have off when people are working.” To Larry, the hours are one of the biggest negatives of working as a chef. Stress and working in the restaurant industry go hand in hand. When working in a kitchen, there are bound to be times when the tickets start to pile up and you have to rush to put out orders. Some people thrive in this type of setting and others don’t. If you can’t handle stress well, becoming a chef might not be the right option for you. If you want to work in a fine dining setting, a culinary school degree is a must, says Greg. Experience is helpful, but culinary school opens a lot of doors that wouldn’t be available otherwise. Larry believes that the purpose of a degree is to set a goal for yourself and accomplish it because, regardless of your background, everyone starts in the dishroom or on the line. That being said, both chefs agreed that a candidate with a degree plus experience is more appealing than someone who just has their degree. Working as a dishwasher or a line cook, you can expect long hours for roughly $10 an hour, depending on your location. Your pay, after deducting rent, culinary school loan payments, and living expenses, doesn’t leave much. But, fortunately, with experience you can move up the ladder and start earning a more comfortable living. Greg says that you get out of the job what you put into it, and in order to grow and make more as a chef, you need to constantly study and learn. There are a ton of different jobs in the foodservice industry, ranging from caterer and restaurant owner to food stylist and personal chef. Each of these jobs are radically different, and they all have their own pros and cons. Both Greg and Larry have worked at different types of foodservice establishments, and they have both worked at upscale and casual operations. Larry says he personally disliked working at banquets and catered events because you tend to spend all of your time working on one dish. He prefers to work on a line, which offers more variety in what you're cooking. On the other hand, Greg enjoyed working in hotels, country clubs, and other fine dining establishments because they provided variety, but in a beautiful and interesting setting. Working as a chef gives you more freedom and allows you to be more creative than just about any other career. Cooking also encourages you to make adjustments and create new and interesting flavors. Even recipes are just guidelines, and you can change the ratios and add new ingredients to make a dish your own. In addition to the creativity of the job, Larry enjoys working in foodservice because there’s constant change and every day is different. Being a part of a kitchen team helps create a sense of comradery that’s similar to being on a sports team, according to Greg. To function, the kitchen staff needs to come together and work as a unit. As a result, working in a kitchen on a team is an incredible bonding experience, and you'll eventually grow close with your teammates. The bond created in a kitchen is so strong that Greg invited former co-workers he hadn’t seen in 6 years to his wedding, due to the strength of the relationship made during their time working together. Foodservice jobs can be found all over the world and in a variety of settings, so if you work in restaurants, your job can take you to all sorts of interesting destinations. For instance, if you've always wanted to live in New York City, you can move there and know there are jobs available to you. Becoming a chef also gives you the freedom to hop around and find the right fit for you. 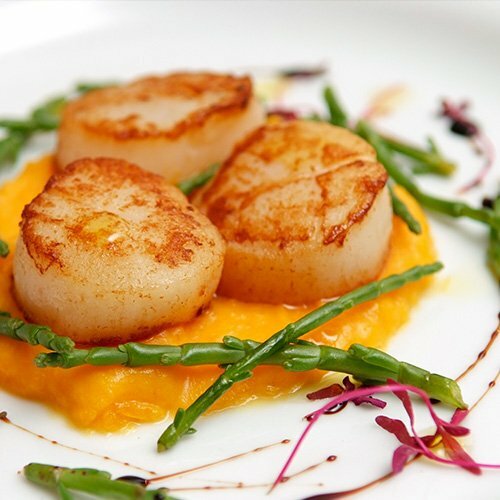 If you don't like working in a fine dining establishment, why not give catering a try? Or find a job at a resort and grill fresh fish for your customers right on the beach. There are many possibilities and options that are open to you when you become a chef, which is something that not many other careers can claim. Greg: Before you start a career, you should consider all of the bad points and weigh them with the benefits for you personally. Make sure that you're passionate and dedicated to cooking, because it's going to become a major part of your life. Larry: What are your personal passions? Because you won't have time to do any of them. Will your personal passions and hobbies compete with your professional passion, and will that be a deciding factor in choosing your career? If you're interested in working in the restaurant industry, you should also get a job in a kitchen for 6 months and try it out. 6 months is a long enough time that any conflicts will come up, and you can decide whether or not it's something you enjoy doing. You can only find out if it's right for you by doing it. Choosing what career you want to pursue is a difficult decision to make, and it's one that shouldn't be taken lightly. Becoming a chef is an excellent career choice, but, as with every job, it has its ups and downs. The long hours, physical demand, and low starting pay can be a difficult pill to swallow, but if you choose to go into foodservice, you'll be rewarded with a fulfilling job that offers tons of freedom and creativity and is constantly changing.